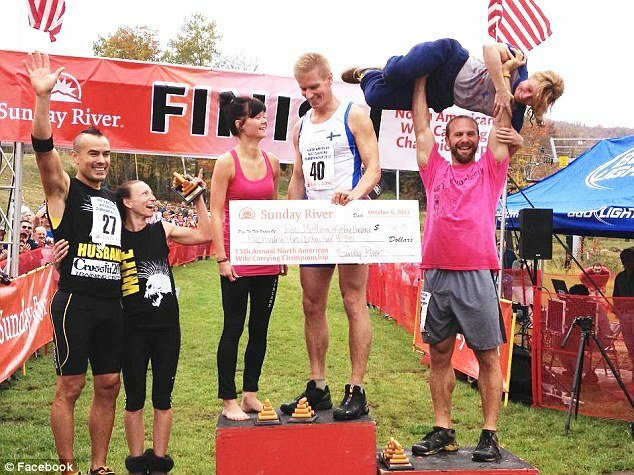 A Finnish couple has won the North American Wife Carrying Championship at Maine’s Sunday River ski resort, just months after winning the world title. Travelling from Helsinki where they won the World Wife Carrying Championship in July, Taisto Miettinen and Kristina Haapanen powered through the 260-yard course in 52.58 seconds’ time on Saturday. For Taisto Miettinen and Kristina Haapanen, that meant a check for $530. Their beer winnings of presumably 106 lbs, according to that sum, they shared with the second and third place finishers. Out of 51 competing pairs, Jesse Wall and Christine Arsenault of South Paris took second place this year with a time of 53.22 seconds. David and Lacey Castro of Lewiston, who won the event two years ago and took second in 2011, finished in 53.66 seconds. “You train all year long for 50 seconds but that’s the way it goes,” David Castro, a former assistant football coach at Lewiston High School told the Sun Journal. The most popular method of carrying the women, used by all winners to date according to the contest, is called the “Estonian” method. Wrapping the women’s legs around the man’s head and hanging upside-down behind them, as Lacey Castro told ABC, it was inspired by how Eastern Europeans use to carry their women, at least according to folklore. “Estonians use to come over to the Finish villages and literally steal wives and run as fast as they could back to Estonia to keep as their own wives,” Lacey Castro said. She adds it having been her suggestion of them entering the competition a few years ago.